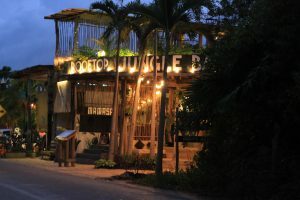 Undoubtedly, one of the highlights of Tulum is the enchanting, jungle beach road that parallels the Caribbean shoreline before turning to dirt at the arch entrance of the Sian Ka’an Biosphere; a nationally protected nature preserve and Unesco World Heritage site similar to the Everglades in the United States. This incredibly scenic 6.5 mile (10.5 KM) beach road is a narrow two lane stretch of pavement beginning just south of the Tulum Mayan ruins winding beneath a jungle canopy south, into the Sian Ka´an Biosphere. 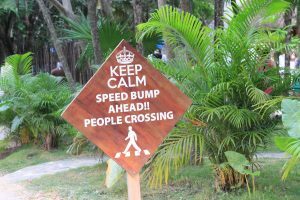 You will likely encounter some traffic on the beach road these days, especially in the high seasons from December to April. Be especially aware of bikers and pedestrians if you are driving. If you are walking or riding, also be aware, the bike lane ends along the beach. Drive slowly as there are bikers, scooters, cabs, water trucks, animals and pedestrians sharing this road together. With the Caribbean Sea on one side of the road and a lot of lush jungle, cenotes (springs) and boutiques on the other, this road is visually resplendent. There is also a lot activity so keep an eye out! 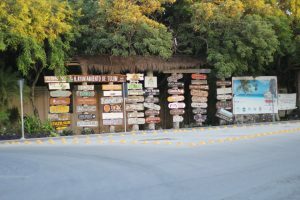 Winding along this paved beach road on the sea side, you will encounter many inviting small cabaña resorts, beach clubs, shopping and restaurants. In fact, there are over 100 small cabaña resorts lining the beach road and most of them have less than 30 rooms. 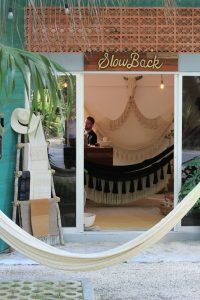 Tulum is quickly gaining a reputation for its hippie chic fashion district! Watch for custom safari tents, boutiques and decorated bodegas nestled in the jungle with alluring clothing, artsy original t-shirt prints, Italian bathing suits and leather goods. Mexican folk art, Talavera dishware and colorful woven goods can also be found. Just beyond view through dense jungle you can find cenotes (cool clear natural springs), and a few campgrounds. Cenotes are bodies of water in a natural pit, or sinkhole resulting from the collapse of limestone bedrock that exposes the groundwater underneath. Cenote water is often very clear and cool, as the water comes from rain water filtering slowly through the limestone. The water is not from the ocean and is not salty, although the closer you get to the ocean it does mix. Please note that when navigating the beach road, it may appear difficult to access the actual beach. It is Mexican law that all properties must allow public access to the beach. Some hotels may have a “walk way” beside the resort to walk through, but many do not. It is acceptable for you to discretely pass through any property to access the beach, be polite and you should not have an issue. Some hotels will welcome you to sit in their beach loungers for free if you purchase a few drinks or some food. Some may charge you a small fee to “rent” their beach chairs and some may not allow you to stay at all! However, by Mexican law, all properties must allow access to the beach. On the beach road parking is limited and areas where it is prohibited are well marked with a crossed out “E” as the Spanish word for parking is “Estacionamiento”. Try to say that three times fast (Saying it three times fast does not mean you get to park there). There are areas where one can park on the road parallel, but you are always better off finding a spot to park off street. Just be sure that the parking lot you choose matches the hotel or beach club you plan to visit. We are also seeing more paid parking areas along the beach road now.